Today is Friday, April 26, 2019. Your local time is 02:20pm. Thank your for choosing My Hidden Folders 2008! 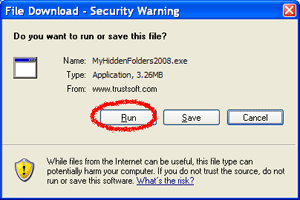 Click "Run" or "Open" to download and Install My Hidden Folders 2008. Click "Save" to start downloading then Click "Open" to Install My Hidden Folders 2008.